Miles Adler-Rich, helped by his friend Hector, spies and listens in on his separati From the acclaimed and award-winning author: a beguiling new novel about an eavesdropping boy working to discover the obscure mysteries of his unraveling family. He uncovers instead what he least wants to know: the workings of his parents' private lives. And even then he can't stop snooping. To ask other readers questions about Casebook, please sign up. Where in the book does Miles see someone he thinks is Eli and the woman who turns out to be Eli's wife Jean? It took place in Pasadena. I'd loke to go back and review that part, but I cant find it. Kaye I don't have the book any longer-- I borrowed it from the library --but as I recall it was at one of Miles's first tennis meets. I'm going to be upfront, I didn't finish Casebook. I have read some good reviews for the book and was looking forward to reading it. Unfortunately, I think I am in the minority when it comes to this book. The book I read wasn't the book I thought I was getting. I got about a third of the way through and gave up. There are a few reasons that this book just didn't work for me. I didn't really like the way it was written. I know that for some people, it will work but I just couldn't get into the fl I'm going to be upfront, I didn't finish Casebook. I have read some good reviews for the book and was looking forward to reading it. Unfortunately, I think I am in the minority when it comes to this book. The book I read wasn't the book I thought I was getting. I got about a third of the way through and gave up. I found the synopsis of this book to be entirely misleading. I didn’t encounter any blatant evil, just stale characters slogging through monotony. This is told from the perspective of Miles, who is nothing but a nosy kid lacking direction. His parents get divorced and his mom starts dating a loser. So Miles takes it upon himself to find any unsavory tidbit he can about Eli to discredit the promises he made - over the course of six very long years. The narrative is a disjointed stream-of-consciou I found the synopsis of this book to be entirely misleading. I didn’t encounter any blatant evil, just stale characters slogging through monotony. This is told from the perspective of Miles, who is nothing but a nosy kid lacking direction. His parents get divorced and his mom starts dating a loser. So Miles takes it upon himself to find any unsavory tidbit he can about Eli to discredit the promises he made - over the course of six very long years. The narrative is a disjointed stream-of-consciousness that just didn’t work for me. It’s like Miles expected his reader to be familiar with all of the characters in his orbit and be in on his inside jokes and characters from page one. I really struggled with this whole book and had to force myself to finish it. I disliked Miles for obsessing over Eli, I hated Eli for his deception, and I couldn’t respect Miles’ mom for letting Eli affect her so much. With so many characters caught up in their own misery, it was just painful to read. I know there are a lot of reviews out there talking about all the problems in this book. I'm just gonna say straight out - none of that stuff bothered me. I know Miles sometimes sounded like a teenager and the next page sounded like an adult. I felt like that was normal. His best friend Hector (maybe gay? maybe Miles is gay too? who knows?) had the same kind of thing happening, but I felt they were both characters I could identify with, and I could have when I was in high school, too. I liked th I know there are a lot of reviews out there talking about all the problems in this book. I'm just gonna say straight out - none of that stuff bothered me. I know Miles sometimes sounded like a teenager and the next page sounded like an adult. I felt like that was normal. His best friend Hector (maybe gay? maybe Miles is gay too? who knows?) had the same kind of thing happening, but I felt they were both characters I could identify with, and I could have when I was in high school, too. I liked the Harriet The Spy vibe going on when Miles and Hector were listening in on phone conversations, trying to find out if The Mims (Miles' mom) was ever going to be happy again after the divorce. I liked the private investigator they hired to look into Eli, the new guy. I liked the way this was mostly a story about growing up and worrying about parents and being a friend. Parents are real people, too, and it's a really hard time finding that out and still being a kid. I loved this book in ways I didn't expect - perhaps because it reminded me of so many things I loved when I was a kid. Harriet the Spy, for instance - I read that book over and over again because I loved the idea of looking into windows, of observing people in the neighborhood and the world and trying to figure out things about them - all kids are snoops, right? It made me think of hanging around on the upstairs landing when my parents had a dinner party and after I was supposed to go to bed - j I loved this book in ways I didn't expect - perhaps because it reminded me of so many things I loved when I was a kid. Harriet the Spy, for instance - I read that book over and over again because I loved the idea of looking into windows, of observing people in the neighborhood and the world and trying to figure out things about them - all kids are snoops, right? It made me think of hanging around on the upstairs landing when my parents had a dinner party and after I was supposed to go to bed - just listening to the adults. I never wanted to go to bed because I was positive I'd miss something. Our hero, Miles, and his friend, Hector, spy on and listen in to Miles' divorcing parents. They snoop their computers, their phone calls, try to figure out things about the new boyfriend (who seems very suspicious to them). Much of what they learn is confusing and a bit scary - what do they do with their suspicions? What is this adult world all about? Will Hector's mother be okay? I was a snoop, but a peculiar kind. I only discovered what I most didn’t want to know. The first time it happened, I was nine. I’d snaked underneath my parents’ bed when the room was empty to rig up a walkie- talkie. Then they strolled in and flopped down. So I was stuck. Under their bed. Until they got up. I’d wanted to eavesdrop on her, not them. She decided my life. Just then, the moms were debating weeknight television. I needed, I believed I absolutely needed to understand Survivor. You had to, to talk to people at school. The moms yakked about it for hours in serious voices. The only thing I liked that my mother approved of that year was chess. And every other kid, every single other kid in fourth grade, owned a Game Boy. I thought maybe Charlie’s mom could talk sense into her. She listened to Charlie’s mom. On top of the bed, my dad was saying that he didn’t think of her that way anymore either. What way? And why either? I could hardly breathe. The box spring made a gauzy opening to gray dust towers, in globular, fantastic formations. The sound of dribbling somewhere came in through open windows. My dad stood and locked the door from inside, shoving a chair up under the knob. Before, when he did that, I’d always been on the other side. Where I belonged. And it hurt not to move. This book I wasn't so crazy about. The premise is awesome. The narrator is a young teen who spies on his parents and learns more than he bargains for about their personal life and then some. Mona Simpson had written in a teenager's voice before in "Anywhere But Here", where a girl grapples with a topsy turvy relationship with an irresponsible mother. But while that novel worked wonderfully, this latest bombed in more ways than one. The premise is similar in "Casebook", though from a 14-year-old boy's point of view. Miles eavesdrops on his smartypants mathematician mother in an innocent enough attempt to find out what the verdict is re: his wish to watch "Survivor" on TV (um hmm, you Mona Simpson had written in a teenager's voice before in "Anywhere But Here", where a girl grapples with a topsy turvy relationship with an irresponsible mother. But while that novel worked wonderfully, this latest bombed in more ways than one. The premise is similar in "Casebook", though from a 14-year-old boy's point of view. Miles eavesdrops on his smartypants mathematician mother in an innocent enough attempt to find out what the verdict is re: his wish to watch "Survivor" on TV (um hmm, you heard right), and then discovers to his horror that his parents' marriage is falling apart. In his panic he enlists the help of his best friend Hector and they embark on a more serious spying mission, involving tapped phone lines. All well and good, except Miles doesn't sound like a teenager half the time, and this is a first person account. One may argue that the book is written on hindsight from an adult perspective, but the fact that Miles does sound like a typical teenager the other half of the time just doesn't add up. And then there is the story. Miles's mom, affectionally called the Mims (though I couldn't find any explanation why she is called that, it just transited from "Mom" to "The Mims" within the first two pages), and the man, Eli, that comes into her life as well as Miles and his twin sisters'. While Miles is understandably conflicted in his feelings towards this new person in his mother's life, his obsession with finding out more about Eli and constant checking on his mom's emotional state just isn't convincingly played out. Simpson tries to embellish this pencil-thin plot with a multitude of characters like Hector's hot mom, Kat, who works for Charlie's mom, Sare, who in turn is a friend of the Mims's, and then there is Marge, who becomes involved with Philip, Hector's dad, but they don't all serve a clear purpose, except for Simpson to assemble a cast of thousands to pepper an otherwise dead narrative. For much of the book, Miles discovers more and more disturbing facts, and that "Everyone had secrets; I understood now that I did. With that one revelation, the world multiplied." Well ok, but the story doesn't end (when it should) when something monumental is finally uncovered about two-thirds into the novel, with the help of an unbelievably goodnatured PI, Ben Orion who is supposed to look a little like Tom Cruise (a description that made me lose all faith in the author's literary prowess). Instead, Simpson chooses to drag it out and for about a hundred pages, Miles keeps revisiting what is uncovered, as if he is picking at an old scab, until even Orion admonishes him to stop it as the case is closed. Miles Adler-Rich is a privileged child of divorce and a burgeoning snoop. He likes to listen to his mother's conversations on the phone. When she starts dating a man named Eli, Miles likes him at first. But as the years pass by, little things don't add up and Miles gets serious about uncovering the truth. The parts of CASEBOOK I liked, I really liked, but it was an uneven read. The beginning and ending both go on for too long. I would admire the dedication to unraveling the consequences to Miles' actions if they weren't mostly mundane and boring. (Hint: It makes his mother sad.) I never found Miles' voice quite convincing either. He's privileged, yes, but he felt so naive to me for a fourteen-year-old boy. And it was just a touch off how he was so much more into his mom's life than his own. There are many things I liked. I did enjoy Miles relationship with his mom, loving her and wanting the best for her. I liked his relationship with his best friend Hector, which ebbs and flows throughout the novel, sometimes strong enough to be mistaken for dating. It's a nice examination of the lengths friends will go to for each other and the underlying tensions that can exist in the best relationships. I like Miles' younger twin sisters, who are slowly revealed to have their own personalities and interests as their brother opens up to them. I liked the detective who helps the boys and chides their stupider impulses. CASEBOOK, like many novels I've read lately, isn't well-served by it's blurb. The blurb promises the boys confronting the existence of evil, which makes CASEBOOK sound much darker than it is. It mostly deals with standard literary-fiction ennui, just through the eyes of a fourteen-year-old boy. There is one revelation of stunning evil that stands out in the fact that it is buried and never mentioned again and I wish it was left out because it was jarringly nasty and really didn't add anything to the story. I think CASEBOOK will appeal to fans of stories about dysfunctional families. The characters are all wonderfully drawn, and there's some brilliant insights into the different ways people love each other and how they treat people they love. Don't, however, go in expecting a juicy mystery. Chuck and I visited Portland recently and while browsing at Powell’s I saw Casebook, a new book by Mona Simpson. I try not to buy too many books in hardback; I can’t afford it, plus I don’t have the space for them. But there are some authors I must have immediately, and Mona Simpson is one of them. Certain books, if you read them at the right time, make a tremendous impression. They not only strike a chord and reflect some inchoate feeling or experience you’ve never been able to articulate, but e Chuck and I visited Portland recently and while browsing at Powell’s I saw Casebook, a new book by Mona Simpson. I try not to buy too many books in hardback; I can’t afford it, plus I don’t have the space for them. But there are some authors I must have immediately, and Mona Simpson is one of them. I might have been losing my mind in that car or I might have been learning the things I needed to know for my life, I couldn’t tell which, but hurtling in the straight line of that still landscape I feared as I always feared given wisdoms, could I keep them and hold them, or would they just streak the dark with their penmanship and fade before the word was through, like fireflies on a Wisconsin dusk, flickering, never captured, writing the story of the world but not on anything so stable as paper or stone but in time so that it was legible only through the decipherment of memory, which was always changing. So there you go. She is a master; any new work of hers is cause for celebration. Simpson’s writing is clear and precise, with a sense of suspense that draws you along a strong taut thread. Her novels are rooted in character, vivid with details of place. And often her prose takes flight, like a rush of adrenaline that sets your heart beating. Her books hold up love and loss like family heirlooms and let the reader gaze at them in awe. Casebook is no different; it is glittering puzzle, compelling and complex. Here, Simpson revisits her theme of children troubled and betrayed by the parental figures in their lives. The book tells the story of a woman, a mother and mathematician, through the eyes of her son, Miles Adler-Hart. After a divorce that Miles, try as he might, cannot parse or deconstruct, a man named Eli Lee comes into his mother's life and generates joy and confusion for the whole family. Casebook is Miles’ reconstruction of that time. I don’t generally like books narrated from a child’s perspective; it’s rarely done successfully and I find it artificial and coy. But Simpson tells a young boy’s story as narrated by his older self, in recollection, which allows her to present adult insights without coming off as stilted. Miles tells his sisters to “chillax” and resents having to toast his own bagel, but also has the sophistication to muse, “I wondered what correlation pain had with reality. All this had already been true a week ago, but she didn’t know and she had still been happy.” He is nosy, insightful, spoiled, and possessive of his mother, and he researches and documents her life with the assistance of his best friend, Hector, who maintains an envious crush on the Mims, as Miles calls her, and the home she creates. There is an explicit connection to the stories of Sherlock Holmes; the mother’s name is actually Irene Adler, Holmes’s great woman character, and the two boys at the heart of the story provide a Holmesian pair, with the narrator playing the part of Watson and the brilliant Hector a stand-in for Sherlock. The narrator is Miles Adler-Hart who retrospectively tells the story of the divorce of his parents and his mother’s subsequent relationship with another man. Miles, from the age of nine, is an old-fashioned snoop; because of his eavesdropping he learns his parents are separating. Later, when his mother begins dating Eli Lee, Miles and his best friend Hector set out to investigate Eli because his broken promises and long absences make them suspicious. The novel is framed as an unfinished manuscri The narrator is Miles Adler-Hart who retrospectively tells the story of the divorce of his parents and his mother’s subsequent relationship with another man. Miles, from the age of nine, is an old-fashioned snoop; because of his eavesdropping he learns his parents are separating. Later, when his mother begins dating Eli Lee, Miles and his best friend Hector set out to investigate Eli because his broken promises and long absences make them suspicious. The novel is framed as an unfinished manuscript written by Miles with footnotes added by Hector. The problem is that Hector’s annotations serve little purpose. They could have added insight into the accuracy of Miles’ memory, but don’t. In my ebook the footnotes appear at the end of the chapter so by the time I read them, they made no sense. Having to go back to find context for those notations is tiresome. Miles as a narrator is problematic. At times he sounds like the young adult he is at the end of the book; at other times he seems much younger, the age he was when experiencing the events described. This blend of childish befuddlement and adult perceptiveness is not illuminating. The passage of time is not clearly indicated so the overall impression is one of disjointedness. Sometimes large spans of time are skipped over; at other times, mundane events are detailed. This choppy flow with its erratic jumps in time adds confusion, not enjoyment. None of the characters is particularly appealing. Irene, Miles’ mother, is especially frustrating. She is a mathematician, intelligent and educated, but totally clueless in many ways. Why she falls for Eli and remains devoted to him for years despite his evasiveness and deceptions is beyond my comprehension. I can understand that a young boy may not understand the romantic relationships of adults, but even as an adult Miles offers little insight. From several descriptions I read, this book sounded really interesting. Unfortunately, it proved not to be so for me. I found I had to force myself to finish it. "I was a snoop, but a peculiar kind. I only discovered what I most didn't want to know." That's the trouble with snooping, we poke around and eavesdrop so that we can know better the people we love and then we're gobsmacked by what we find. Such is the case for Miles Adler-Hart, the narrator of Mona Simpson's sixth novel, "Casebook." Miles is a sweet teenager, a little soft in the belly, who spends his time hanging with chums, sewing mutant animal mash-ups (teddy bear head, horse body, alligator "I was a snoop, but a peculiar kind. I only discovered what I most didn't want to know." Miles is a sweet teenager, a little soft in the belly, who spends his time hanging with chums, sewing mutant animal mash-ups (teddy bear head, horse body, alligator tail) from his twin sisters' stuffed toys, and spying on his parents. What starts off innocently enough, with Miles planting a walkie-talkie in his parent's bedroom in the hopes of overhearing what's happening on the reality TV show "Survivor" ends up with Miles dog paddling in the deep and incomprehensible waters of his parent's private lives. As Miles witnesses his mother's heartbreak through her divorce and her confusing new relationship with shady Eli Lee, his spying techniques grow more elegant. He abandons treehouses and walkie-talkies for better technology, crawl spaces, and eventually a private investigator who helps him uncover startling revelations that threaten his family's well being. We, like Miles, piece things together through snippets of overheard conversations, keen observations and half-baked assumptions. It's a wonderfully dramatic vantage point for us readers, a fresh way to explore the ways families fall apart and come together. "Since October, though, I'd woken at odd times in the night to her crying. I never told that I heard; a measure of her despair was the fear that she was failing us. I hadn't known that happiness was a requirement for parenthood. I didn't know how I would ever manage." Try as we might, we parents cannot shield our children from our pain. Simpson, with her sharp eye and her deep interest in family life, knows this particular desire and failure, just as she knows how much our children want to understand, to help, and how their identities are formed in response to what they see. Yet "Casebook" is far from a divorce soap opera, it's a detective story with a soupçon of upper middle class teen antics such as midnight bike rides, Miles' money making scheme selling cup-a-soup from his school locker, a detective comic strip he pens with his friend, Hector, in an attempt to demystify his parent's break up, and a hilarious revenge plan they cook up once the suspected bad guy is confirmed. Simpson knows these characters and this upper middle class world of privilege well, from the one-upmanship of spring break vacation destinations and SAT scores to the housekeepers and the shabby chic interiors of the homes. Ingrained in this world is the earnest desire to do the right thing, know the crossing guard's name, make small bundt cakes for all the empoyees at the private school, volunteer at the animal shelter. Miles' mother, whom he calls the Mims, has a flea market chalkboard in her kitchen upon which she writes inspirational quotes like this one from Confucius, "Before you embark on a journey of revenge, dig two graves." Overall, "Casebook" surprises us with its discoveries and offers up a sweet reminder that despite troubles and disappointments, confusion and heartbreak, life can be sweet. As Miles notes, "Hope for happiness is happiness." I have been a fan of Mona Simpson since I read Anywhere but Here lo those many years ago. She understood the perspective of an unsettled teenage girl, as well as that of the girl's mother. I've been hooked ever since. When we meet Miles Adler-Rich, he is a grade schooler who discovers while eavesdropping that his parents' marriage is fracturing. He overhears his father say that he has an interest in another woman. Miles' curiosity is piqued, to say the least, and I have been a fan of Mona Simpson since I read Anywhere but Here lo those many years ago. She understood the perspective of an unsettled teenage girl, as well as that of the girl's mother. I've been hooked ever since. When we meet Miles Adler-Rich, he is a grade schooler who discovers while eavesdropping that his parents' marriage is fracturing. He overhears his father say that he has an interest in another woman. Miles' curiosity is piqued, to say the least, and thus begins his journey into domestic spying. As Miles grows up, his fascination with his mother only increases. I don't mean in an Oedipal kind of way, although I'm sure Freud would disagree; Miles seems to truly want to understand her more than anything. What kind of woman gets left by her husband, forced to raise a son and two daughters (twins whom Miles refers to as Boop One and Boop Two), and doesn't give up? That's the thing about Miles' mother: she never stops believing that better is just around the corner. She refuses to allow the divorce to defeat her. Mirroring this somewhat is Miles' friend Hector's parents, also divorced, but perhaps not as amicably as Miles'. Hector joins Miles in the spy game, which becomes increasingly vital and fascinating to the boys as Miles' mother begins to date. Mims' Man Friend is a nerdy guy who lives on the opposite coast of Miles and his California home. But Mims likes this guy, and Miles considers it his job of sorts to suss out Eli. There are comic moments in Miles' espionage, as well as within his family and friends. But there is a sort of bittersweet sheen to this story, a sense that Miles will uncover some things that could lead to heartbreak and loss of innocence. We watch Miles grow up into manhood, and Simpson expertly delivers those changes of voice that must occur as a character matures. With each nugget he finds, Miles grows a little, and Simpson reveals this with delicacy and affection. She even completes the intricate feat of allowing adult Miles to comment on child Miles' thoughts and experiences. Of course, Miles does uncover some somewhat unsavory details about some of his spy subjects. He finds them disturbing enough that he calls in an investigative expert, Ben Orion, who fills in the gaps left in Miles' life by his divorced parents. Ben Orion is more than just a supporting character, though. He helps not just Miles, but Miles' family. I found myself wishing I had a Ben Orion in my life. Miles also sees his hero worship of his father take a dent, although not an awful one. As Miles himself observes, he's okay with his father's lady friends because he doesn't feel threatened by them. One of the few "good" things Miles' father does is maintain a strong relationship with his children, and even with his ex-wife, and that makes a powerful impact on the boy. There is a little mystery here - what's up with Eli? - but the heart of this story is Miles, a boy growing into a man and all of those attendant issues. Remember when you discovered that your parents weren't the mythical, mystical masters of the universe you thought they were? It's something you observed and experienced over time, right? Perhaps Miles' realization is less organic, but its lessons are as real as any you've experienced. 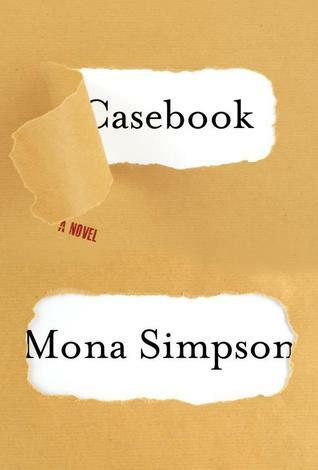 As Mona Simpson's newest novel, Casebook opens, Miles is twelve years old when his parents separate. His mom, Irene (whom he calls the Mims) is a mathematician, not an occupation you find frequently in novels. His father Evan is a lawyer in the entertainment industry and they live in Los Angeles. He has younger twin sisters whom he calls Boop One and Boop Two. His best friend Hector's parents aren't together either. Hector has a bit of a crush on the Mims, and he is more than willing to help Mile As Mona Simpson's newest novel, Casebook opens, Miles is twelve years old when his parents separate. His mom, Irene (whom he calls the Mims) is a mathematician, not an occupation you find frequently in novels. His father Evan is a lawyer in the entertainment industry and they live in Los Angeles. He has younger twin sisters whom he calls Boop One and Boop Two. His best friend Hector's parents aren't together either. Hector has a bit of a crush on the Mims, and he is more than willing to help Miles figure out why Mims and Evans are separated and whether they are headed towards divorce. Miles has heard rumblings that Mims cheated on his dad, and to find out the truth he rigs up a phone extension so that he can listen to his mother's phone conversations. Mims soon begins dating Eli, who works for the National Service Foundation in Washington. Eli seems like a good guy, but he is in the midst of a divorce from his wife and he misses his young son. His mother recently died, and he has a brother who has mental health issues. Eli promises Mims that he will move out to Los Angeles and they will be a family, she just has to give him time. And more time. And more time. And then he has to take care of his dying cat, who seems to hang on forever. Miles and Hector become suspicious of Eli, so they seek out a private investigator, whose jobs usually consist of background checks on reality show contestants (Big Brother, The Bachelor), but there is something about these boys that gets to him, and he agrees to help them without pay. Casebook puts me in mind of Caroline Leavitt's recent novel Is This Tomorrow?. They both tell the story of a lonely young boy, who loves his mom very much, and takes on her problems. They both tell the story from the boy as an adult looking back on his life. And they both feature strong characterizations and beautiful writing. It took me awhile to get into Casebook, but about halfway in, I fell in love. Miles and Hector are such real, wonderful boys, trying to make sense of an adult world. Mims got to me too; she so wants this relationship with Eli to be the real deal. Simpson creates believable characters that you feel you know. Her description of Sare, one of Mims's friends is a good example. "She was way cooler than my parents. Sare was a very smart person who never tried anything too hard for her. She had that confidence and that boredom." My only criticism of the book is that there are many characters, and at first it is difficult to keep track of who belonged to whom. And the fact that Miles had nicknames for his mom and sisters confused me when other characters called them by their given names. Miles and Hector write a comic book based partly on Eli, and I'm glad we get to see the results of their work. Hector also has footnotes in the book, giving his point of view on things that Miles has written about him, which adds a unique perspective. The ending is poignant, much like Is This Tomorrow?, and if you liked that novel, you will love Casebook, as I did. It's a beautiful coming-of-age story, sure to touch your heart. I read Simpson's Anywhere But Here five times. It was something I went to for comfort, clicking into the wisdom and resiliency of Ann August (even though, the first time i read the book, I became so incensed with her mother that I pitched the paperback across the room). I read her next two, The Lost Father and A Regular Guy and loved them as well. But My Hollywood disappointed and so did this one. I'm sorry, Mona Simpson, I just don't get you anymore. Starts off slow and a little strange, and somewhere along the way becomes a deeply moving tale told from the intimate perspective of a teenage boy. I found the events were sometimes hard to follow--the chronology unclear, pieces of the story left out; but by the last page, the patched-together feeling of the narrative made perfect sense, even if every moment of the narrative didn't. Is it true? Is it kind? Is it necessary? Will it improve upon the silence?" That's the motto Miles' school goes by. This was such a fun read! I was a little skeptic after skimming over the reviews and lots of people didn't seem to like it at all. I was surprised how often I had to laugh about the weirdness of Miles and Hector. Their relationship of best buddies was so great! Miles and Hector are snooping around his parents' life after their divorce and finding out things which confuse them even mo Is it true? Is it kind? Is it necessary? Will it improve upon the silence?" When Miles Adler-Hart was 12 he originally began eavesdropping on his parents in a vain attempt to discover any plans they might have for his futures. Instead of talking about him, Miles discovers that their relationship is in trouble and they are getting divorced. After the divorce Miles' mother, Irene, introduces him to her boyfriend, Eli. With the help of his friend, Hector, Miles increases his surveillance on his mom and this questionable new man. Miles and Hector eventually befriend a PI to help in their investigation. Miles says of Eli: "It was odd story. Like the brother. A lot of Eli’s life seemed weird. Sad, too. I felt that even then. But sad in a way that had no poignancy. More like a disease I hoped wasn’t contagious." Simpson follows her teenage protagonist Miles from age 12 to post high school, with most of the novel centered around Miles to about age 15. This novel manages to transcend the usual teenage novel full of angst associated with a broken family and the ensuing financial stress it causes by focusing on the mysterious relationship between Irene and Eli as seen through the eyes and ears of a sometimes clueless, sometimes insightful Miles and Hector. There is also a dose of humor in Miles story through some of his schemes and antics, along with the poignancy of an alienated teen during a tragic time in his life. The novel is set up as an account after the fact, with a present day Miles and Hector as successful comic book authors, with footnotes added later with comments on what is written. This is a coming-of -age novel with a mystery entwined in the story. Simpson does a wonderful job capturing Miles thoughts for his age while allowing Irene's personal struggles to remain somewhat aloof and beyond Miles' ability to comprehend. In many ways Simpson's account is a somewhat sanitized picture of what divorce means to many women and children. While there is definitely emotional strain, the devastating blow that many experience emotionally and financially isn't pictured quite as insidious here as the reality is for many. The quality of Simpson's writing and her ability to really allow us to connect with her teenage protagonist help to elevate Casebook up from just-another-coming-of-age-story to a novel with a mystery to unravel while we gain insight into all of the characters. Considering it's a novel narrated by an adult looking back at his teenage years (I think some reviewers missed that, in complaining about the switch between teenaged voice/adult voice in the narrator--this is a book that is meant to explain a prior successful comic that the narrator was a coauthor of as a young man, but that's made clear on the first page), "Casebook" made no sense as a title and I almost put it back down. But I was hooked from the first line (not an easy thing to do to me) and I sat for hours in an extremely uncomfortable chair while DESPERATELY having to pee, but not wanting to interrupt the story. I have a pinched nerve in my back and I'm going to have the lamest story ever to tell my physical therapist on Monday. It's taken quite a few attempts to read CASEBOOK, it's been one of the most picked up and discarded books in the review pile for quite a while. The idea behind it was part of the problem – a young boy eavesdropping on his family as his parent's marriage falls apart. It feels therefore like it's going to be very personal. Devastating even. Unfortunately the storytelling relies heavily on the stream-of-conscious voice of young Miles – who frankly – doesn't feel “real”. Or maybe he just doesn't feel It's taken quite a few attempts to read CASEBOOK, it's been one of the most picked up and discarded books in the review pile for quite a while. The idea behind it was part of the problem – a young boy eavesdropping on his family as his parent's marriage falls apart. It feels therefore like it's going to be very personal. Devastating even. Unfortunately the storytelling relies heavily on the stream-of-conscious voice of young Miles – who frankly – doesn't feel “real”. Or maybe he just doesn't feel right – too voyeuristic. Odd. Creepy. Certainly tediously addicted to the sorts of injokes that some people like to use to keep others on the outside. It's not hard to get the hint you're not part of the cool group. Which isn't a great way to be made to feel if you're reading something. It made every paragraph, every chapter, every page a drag. Constantly being reminded of not getting the joke, by a kid that was making your skin crawl a bit, and about people that frankly were considerably more dreary than anything else. I was bored. And annoyed. The more I got so obsessed with how bored and annoyed I was, I found I was reading just to make myself more and more convinced that I was right to be bored and annoyed. About half way through I found I couldn't even remember who most of the characters were, but I was still bored. And annoyed. So I threw in the towel on CASEBOOK about three-quarters of the way through. Which is most unusual – normally I can find something. But in this case the voice didn't work, the characters weren't interesting, likeable, identifiable or understandable and their path to salvation was definitely not heading in my direction. Initially, I wondered if a book that revolved around a youthful narrator who spied on his parents would culminate in an adult fiction storyline, but I couldn't have been happier with my decision to read Casebook. When I laughed out loud by the end of the first page, I knew I'd found a good book. The voice of teenage Miles capitalized on his naiveté, which added an element of humor I haven't experienced since The Curious Incident Of The Dog In The Night-Time, a book I absolutely loved and continu Initially, I wondered if a book that revolved around a youthful narrator who spied on his parents would culminate in an adult fiction storyline, but I couldn't have been happier with my decision to read Casebook. When I laughed out loud by the end of the first page, I knew I'd found a good book. The voice of teenage Miles capitalized on his naiveté, which added an element of humor I haven't experienced since The Curious Incident Of The Dog In The Night-Time, a book I absolutely loved and continue to talk about! When Miles put a listening device in his parents' room, he learned more information that he bargained for once they decided to divorce. After adjusting to his father moving out and being left with his twin sisters, Boop One and Boop Two, Miles focused his efforts on vetting his mother's new boyfriend, Eli. When things with Eli didn't add up, Miles hired a private detective and uncovered a shocking secret that he didn't know how to deal with. His awkwardness was another point of comedy. Those encounters were the highlight of the book for me. I was less enthusiastic to read the last hundred pages where Miles' life revolved around being a high school student and having a girlfriend. The ending was also slightly depressing given the humor in the first half of the book. The author focused on the relationships among family members and showcased Miles' devotion through the selfless actions he did to benefit the Boops and his mom. This made him a likable character I enjoyed watching develop. This was an odd book. I like what the author was trying to do, but the actual execution came up short. Didn't help that the blurb about the book is very misleading. The story is supposed to be the childhood memoir of the main character, Miles. Apparently, he (and his friend Hector) became niche-ly successful and their fans are demanding more from them. This is their response - not a comic book (the basis of their previous success), but a sort of behind the scenes look to see how their inspiration started. My expectation at the outset was that this book would be more based in mystery than it really was. In reality, this is more a story about a boy coming to grips with adulthood. In Miles, Simpson has created a charming and witty narrator whose story is quite amusing. The premise that this is a book he and Hector have written after the fact (complete with the occasional end note in conversation between the two) is amusing but perhaps not used enough to be thoroughly convincing. In other words it's a My expectation at the outset was that this book would be more based in mystery than it really was. In reality, this is more a story about a boy coming to grips with adulthood. In Miles, Simpson has created a charming and witty narrator whose story is quite amusing. The premise that this is a book he and Hector have written after the fact (complete with the occasional end note in conversation between the two) is amusing but perhaps not used enough to be thoroughly convincing. In other words it's an element the book could have lived without but had it been used more I think it would have made Casebook much improved (and given more of an opportunity to connect with Hector as a character as well). All in all this was a book that just didn't completely draw me in in part because I kept waiting for the mystery to begin. And yet, even had I been prepared for more of a coming-of-age story, Casebook would still have ended in disappointment for me. In spite of all the positive notes (great character development in Miles and those around him, hilarious boyish hijinks, and the wonderful way Simpson illustrates adult behavior through the eyes of a young boy) the ending fell completely flat. There are many things to love about this book, especially if you aren't the apparently mystery manic person I am - seeing hints of intrigue around every corner - but I came THIS close to abandoning it multiple times before finally stumbling my way across the finish line. Meh. What happens when a person finds that one true love of her life? Most often, these stories are told from the point of view of the woman; this time the love story is offered from the perspective of the fifteen year old son who spies on his mother and hires a private detective to help him uncover the truth about Eli, her boyfriend. Miles and his friend Hector rig up a device to listen in on his mother's conversations with her lover. His intention is to figure out whether his mother is happy and ho What happens when a person finds that one true love of her life? Most often, these stories are told from the point of view of the woman; this time the love story is offered from the perspective of the fifteen year old son who spies on his mother and hires a private detective to help him uncover the truth about Eli, her boyfriend. Miles and his friend Hector rig up a device to listen in on his mother's conversations with her lover. His intention is to figure out whether his mother is happy and how his family's life will be enriched or depleted by her choices. Recently divorced, Miles' mother and father are still trying to maintain a friendship that benefits the family - the kids - Miles and his twin sisters, the Boops. Miles is right on the cusp of young adulthood. He does not have a girlfriend, has never been kissed and as he explains is sexually neutral. He and his friend Hector collaborate in their investigation of big adult questions: what is the importance of truth in a relationship, how can a person be so easily deceived, what makes a good marriage, what makes a good friendship, how do you protect those you love. There’s nothing unusual in a suburban story about divorce and how that affects kids but somehow Simpson manages to make it unique. Miles Adler-Hart (the hyphenated name is made up of both his parents’ birth names) is a typical kid…or is he? I suppose the use of the both his parents’ names is telling in itself. The Adler-Hart family lives in Santa Monica California. They shop at Wholefoods. The kids have attended the same private school with kids just like them since they were old enough to go to There’s nothing unusual in a suburban story about divorce and how that affects kids but somehow Simpson manages to make it unique. Miles Adler-Hart (the hyphenated name is made up of both his parents’ birth names) is a typical kid…or is he? I suppose the use of the both his parents’ names is telling in itself. The Adler-Hart family lives in Santa Monica California. They shop at Wholefoods. The kids have attended the same private school with kids just like them since they were old enough to go to school. There are no grades. Miles has had the same best friend since kindergarten. Obviously he’s not looking forward to any big changes in his life. Though he’s unmotivated academically he’s scrupulous with his spying efforts when he begins to worry that his parents are arguing too much. The kid’s a fanatic in this sense and so is his best buddy. The lengths they go to to find out what’s happening are ridiculous as well as tragic. “Casebook” is sad and funny at the same time but then if you’ve read any of Simpson’s other books you already suspected as much. This a coming of age story with a twist and that twist is that everyone, adults as well as children, grow up. Mona Simpson was born in Green Bay, Wisconsin, then moved to Los Angeles as a young teenager. Her father was a recent immigrant from Syria and her mother was the daughter of a mink farmer and the first person in her family to attend college. Simpson went to Berkeley, where she studied poetry. She worked as a journalist before moving to New York to attend Columbia’s MFA program. During graduate sch Mona Simpson was born in Green Bay, Wisconsin, then moved to Los Angeles as a young teenager. Her father was a recent immigrant from Syria and her mother was the daughter of a mink farmer and the first person in her family to attend college. Simpson went to Berkeley, where she studied poetry. She worked as a journalist before moving to New York to attend Columbia’s MFA program. During graduate school, she published her first short stories in Ploughshares, The Iowa Review and Mademoiselle. She stayed in New York and worked as an editor at The Paris Review for five years while finishing her first novel, Anywhere But Here. After that, she wrote The Lost Father, A Regular Guy and Off Keck Road.